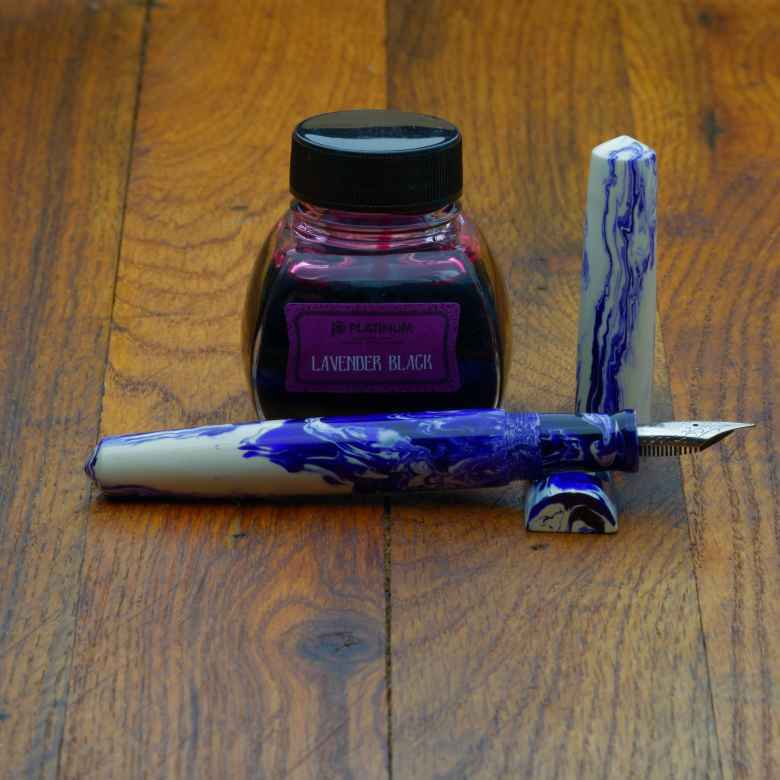 Wherein my Ghost Koi Scriptorium Pens Idyll prototype (IF) is paired with Platinum Classic Lavender Black. On December 9, 2017 my Ghost Koi Scriptorium Pens Idyll prototype (IF) joined its comrades when it was filled with Platinum Classic Lavender Black. I refilled it 2 times; the last refill was on July 23, 2018 . The pen was in use for one year and was emptied and cleaned on January 4, 2019 , saying good-bye to its fellows. It’s time to rotate another purple ink in for my daughter’s diary. This time around I’m going to use a waterproof ink with the hope that her diaries will last her life, and when she’s an old woman she can still read them and remember how much I love her. I haven’t used my Ghost Koi pen in quite some time, and I recently modified the nib so I thought I’d put the pen back into service. I’m looking forward to this! Of the three pens I used all year for daughters’s diaries, this was by far my favorite, which surprised me. The nib was perfect, offering a delicate line which matched the ink to my mind. The ink went down a lovely shade of purple and darkened quite delightfully. The end result, especially on cream paper, was a visual delight. I am surprised that I only had to refill this pen twice throughout the year, considering I used it every-other day, which is a testament to the fineness of the line. I’m retiring this combination for now, but I suspect I will one day return this ink to this pen.